Lockets are timeless. 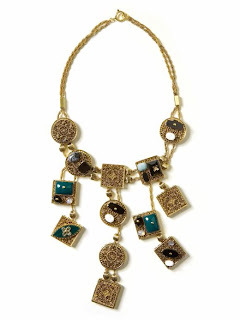 Locket bib necklaces? Perhaps not so much. Featured in the NYT's The Cut blog , they marvel over this Banana Republic piece, calling it a favorite of BR's fall jewelry collection. While I think it's fantastic to use a classic piece of jewelry in modern way, I am not really a fan of this one. I love the bib necklace trend, but I think I would like it better if the gems were different shapes and colors. I have a simple gold locket from when I was younger, and I prefer lockets like these. What do you think of BR's bib locket necklace? Do you like or prefer the more simpler ones like me? simpler ones for me! i like the second one, in the top row.simple and classy! and OMG believe me, you're gonna love him MORE as the story goes by!! i know...2 days!! i sat down the whole weekend and did nothing except read, i cudnt put the books down!you shud totally read the 4th book, it's the best! I'm not sure, in general I think I go for the more simple ones just because they can be worn with anything; but I know that I wouldn't shy away from something bigger and bolder! Everything has its time and place! I totally agree with you...the bib necklace is WAY too much. I think it might even look better wrapped around your wrist 2x. I love the look of a simple, beautiful single locket with an antique family photo inside.